In a game in which points were tough to come by, Lebanon Valley did grabbed an early lead and kept Misericordia off the board the rest of the way in the team's 17-0 shutout victory at MU's Mangelsdorf Field on Saturday afternoon, Oct. 21. The Flying Dutchmen (4-3, 4-2 MAC) struggled to get anything going on their first two offensive possessions before finally getting on the board when kicker Marcus Brown converted a 36-yard field goal with 6:53 remaining in the opening quarter. LVC showed off its big-play capabilities when quarterback Tyler Sterner connected with wide receiver Jeremy De La Cruz for a 65-yard touchdown on the first play of the team's next possession to stretch the advantage to 10-0 late in the first quarter. From there, it was a slog as both teams struggled to move the ball and produce points. The Cougars (1-6, 1-5 MAC) put together their best-looking drive of the day early in the second quarter when they drove 61 yards in 11 plays and were faced with a second down from the LVC eight-yard line. Cornerback Mike Gilger put an end to the threat, however, when he picked off MU quarterback Brian Williams in the end zone with 7:24 left in before halftime. The third quarter came and went without any points but the Dutchmen finally broke the scoreless drought early in the fourth when Tim Pirrone finished off an eight-play, 66-yard drive with a touchdown run from one yard out. The insurance score came after a pair of long runs by tailback Steve Salerno and gave the visitors much-needed breathing room down the stretch. Misericordia moved the ball deep into LVC territory on the ensuing drive but the Dutchmen defense held on fourth down from Lebanon Valley's four-yard line. When they got the ball back, the Dutchmen churned out the final 7:24 by running the ball 12 times in a row. When Lebanon Valley got the ball back on its own 34-yard line with 14:13 left to play, its 10-point lead didn't seem insurmountable, despite Misericordia's inability to put points on the board. The Dutchmen used five straight runs by Steve Salerno that accounted for 52 yards to move to within inches of paydirt and Tim Pirrone capped off the march with a one-yard touchdown run that made it 17-0 with little more than 10 minutes remaining. With the way the MU offense sputtered against LVC's defense on Saturday, there was no hope for a comeback for the Cougars at that point. - Lebanon Valley held MU to just 213 yards of total offense. The Dutchmen racked up nearly 400 yards of offense by comparison. - The Cougars twice reached the red zone but the LVC defense turned them away on both occasions. - The Dutchmen won the turnover battle 2-0. - LVC imposed its will in the run game, rushing for 270 total yards on the ground. 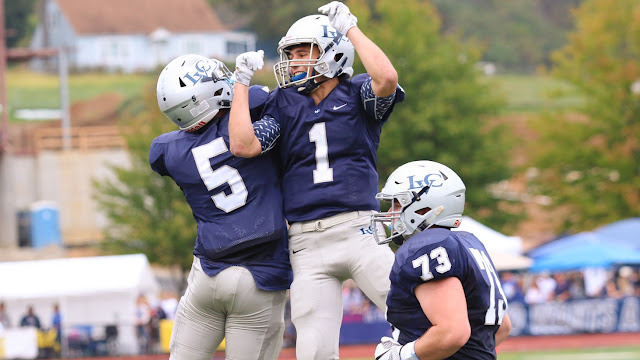 - For the Lebanon Valley defense, Saturday's shutout was its second of the season. - Quarterback Tyler Sterner threw for 123 yards and a touchdown. - Tim Pirrone rushed for 97 yards and a score on just seven carries, while fellow tailback Hunter Wilson racked up 94 yards on 15 touches. - Steve Salerno was also strong in the run game, averaging 6.6 yards per attempt. - Wide receiver Jeremy De La Cruz made two catches for 70 yards and a touchdown. - Linebackers Tim Schumacher, Tom Gallagher, and Tommy Garner led the way with six tackles apiece. - Garner added a team-high 1.5 tackles for loss and a pass breakup. - Defensive tackle Ryan Johnson forced a fumble and added 0.5 TFL. - Cornerback Mike Gilger picked off the game's only pass. - Defensive linemen Austin Maguire and Wyett McLeod each had 0.5 tackles for loss. - Marcus Brown's 36-yard field goal was his second-longest conversion of the season. Lebanon Valley has now recorded two shutout victories on the season. It is the first time this century that the Dutchmen have held their opponents scoreless more than once in a year. The Dutchmen face their toughest test of the season when they travel to take on undefeated No. 5/9 Delaware Valley on Saturday afternoon, Oct. 21.